Four stage intelligent chargers with 12 Volt, 24 Volt, or 48 Volt inputs, to charge 6 Volt, 12 Volt and 24 Volt lead acid batteries, (flooded, VRLA, Gel, or AGM.) Charge a wheel chair, bicycle or scooter in your car or van. You don't always have AC power to charge batteries with. Here are some battery chargers that use DC input power. PST-DCCP Up to 36V <1V to 32V, as long as the maximum charge voltage is at least 1V lower than the source voltage. Can taper charge a lead acid or lithium ion pack at up to 5 Amps constant current. 12 Volts (10-15VDC) 12 Volt sealed lead acid batteries These 4 stage chargers can be used to charge 12 volt batteries from larger 12 volt batteries, or automobile power points (cigarette lighter sockets). Great for emergencies, camping, boating, e-bikes, etc. 12 Volts (10-15VDC) 24 Volt sealed lead acid batteries. High power 4-stage intelligent chargers for charging wheelchairs and scooters in your van or car. 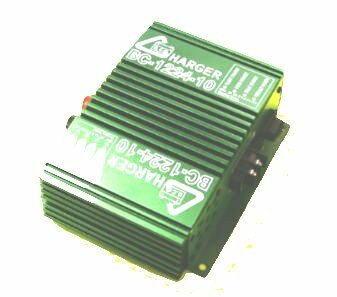 These microprocessor controlled board charge a 12 volt lead acid battery from a low voltage DC input that can range from 18 to 28 volts. This lets the charger be positioned at a remote battery while being powered with low voltage DC up to 1000 feet away. This rapid battery charger charges 2 or 4 AA and AAA Ni-Mh/Ni-Cd rechargeable batteries quickly and conveniently from home or car. Two current settings for different battery capacity. Select "low" if the battery is less than 7 AH in capacity. Note: For the higher current models the input current is too high for a cigarette lighter socket to handle. This charger must be wired into the battery-alternator circuit of your car or van. Wheelchair chargers, electric bike chargers, and scooter chargers for charging a 24 volt battery from a 12 volt source such as a car, van, or boat.